Sedgefield Village Games is an umbrella organisation which helps to promote sports development, predominantly for young people in the County Durham town of Sedgefield. The Games were originally organised to mark both the London 2012 Olympics and Paralympic Games, and also the 700th anniversary of Sedgefield being awarded its Market Charter. The event was organised by a committee of volunteers from local clubs, societies and schools, with the support of the town council. 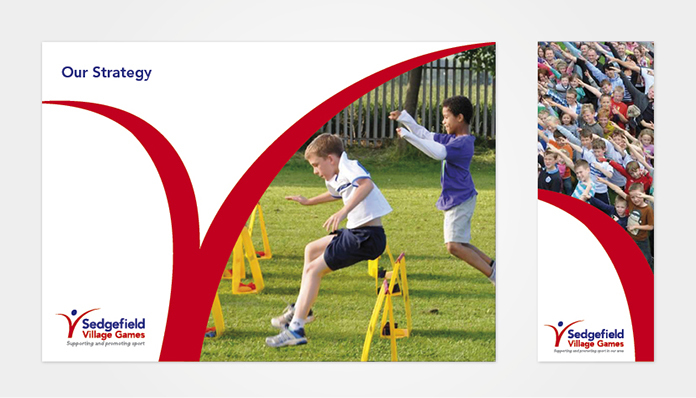 Due to the success of the Games in 2012, the founders wanted a brand identity to help Sedgefield Village Games develop from a one-off event into an on-going community group. As well as arranging more events in the future, the Games committee also envisage that the re-constituted organisation will offer support to local sports initiatives and award bursaries and access to courses to talented young sports people. I was approached by the Games Committee and was only too happy to design the branding and identity for Sedgefield Village Games. Share the post "Sedgefield Village Games"